Passionate, wonderful, energetic, and caring are just a few of the exclusively favorable adjectives people use to describe Shoreh Elhami, the founder of GISCorps. The organization, a program of the Urban and Regional Information Systems Association (URISA), connects volunteer GIS practitioners with nonprofits and emergency relief programs all over the world when they need help with mapping. Since its establishment in 2003, GISCorps has launched more than 175 missions, attracted more than 4,000 prospective volunteers from about 100 countries, and deployed around 950 volunteers for both on-site and remote projects. 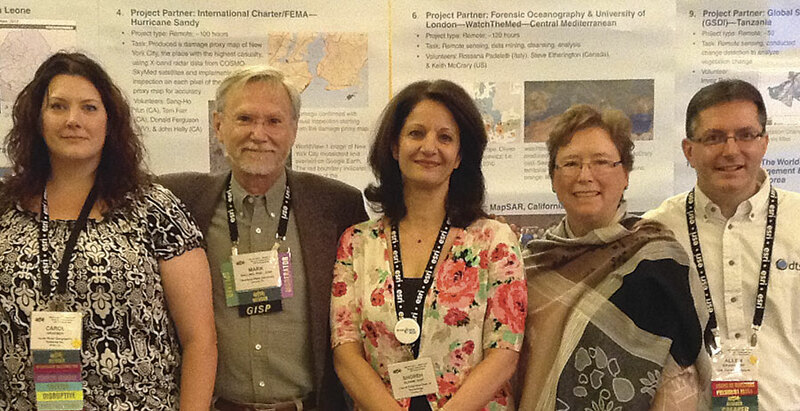 Shoreh Elhami (center) with GISCorps Core Committee members (from left to right) Carole Kraemer, Mark Salling, Dianne Haley, and Allen Ibaugh. "The idea was to go out and teach people about the technology in different parts of the world," said Elhami about the founding of the organization. She envisioned having volunteers go to places where either the GIS skillset was completely lacking or people couldn't afford to learn the technology. "The main objective was to help others with what you know and what you're capable of," she added. Elhami was bitten by the GIS bug when she was a master's student in city and regional planning at Ohio State University. As a research assistant, she used the technology and realized early on that it was a much faster way to do the mapping and analytics work she had done by hand as an urban planner and architect in Iran. "From then on, I was on a quest to see what more I could do with this," said Elhami. That purpose has guided her career. As a GIS coordinator for the Delaware County Regional Planning Commission, she and her team created one of the first county-comprehensive plans that used GIS for analytical purposes. When she was recruited to be the GIS director for the Delaware County Auditor, she led the effort to build the organization's GIS division from scratch. As an adjunct professor at Ohio State, she stayed connected to her urban planning background while devising forward-thinking GIS curriculum for her nighttime classes. And, currently, as the GIS manager for the City of Columbus, Ohio, she and her team find new, fantastic uses for GIS every week that help people get their jobs done better and more quickly. "The impact and the use and the benefits of GIS are now so much more widespread than ever before," said Elhami. "In many cases, until it's put in front of [people], they don't know what they're missing." Elhami's goal with GISCorps is to make the technology even more far-reaching than it already is. She and the organization's other six Core Committee members volunteer their nights and weekends to run GISCorps. They sift through project requests, track down qualified candidates from the organization's extensive database, write up and send out job descriptions, review applications, interview prospective volunteers, and handle logistics for green-lit assignments. Elhami estimates that she has spent part of 90 percent of every weeknight working on GISCorps. "It's what I do and love," she said. "Nothing makes me happier than helping someone whom I feel my expertise can help." This same sense of wanting to give back permeates the organization. That is why Elhami believes that the GISCorps volunteers are the real GIS Heroes. "There's nothing like meeting people who are like-minded, like-hearted," said Elhami about the volunteers. David Litke, another Core Committee member, echoed this when talking about a recent project—an urgent call at the end of 2014 to help the World Health Organization (WHO) map its Ebola response activities in West Africa. "We had 50 or 60 people that were willing to travel at a moment's notice over the holidays to a place where the Ebola epidemic was going on," said Litke. "Being made aware of having such great volunteers that were willing to do that impressed me a lot." GISCorps volunteers come from about 100 different countries. GISCorps deployed four volunteers to help with the effort: Leslie Zolman, who went to Ghana; Charleen Gavette, who worked in Liberia; Jeff Pires, who traveled to WHO's headquarters in Geneva, Switzerland; and Emmanuel Lansana, who worked in Sierra Leone, where he also lived. "I really loved being there," said Zolman, a GIS coordinator with the Montana Office of Tourism and Business Development and the Montana Department of Commerce. She spent just over five weeks in Ghana, where the United Nations (UN) had set up headquarters for the UN Mission for Ebola Emergency Response (UNMEER). Initially deployed to coordinate with the affected countries to get their data in ArcGIS Online, Zolman and her GISCorps colleagues ended up doing much more basic—and badly needed—data collection and cleansing. "It became evident that the administrative boundaries that people were using weren't really correct," said Zolman. "They didn't really nest with each other." There were more than 300 cases of Ebola that couldn't be pinpointed anywhere because of data problems. So Zolman worked with the affected countries to get their data, clean it up, and put it into maps. Gavette's work fed into this too. When she arrived in Liberia, she found out that no field data was being collected. "No mapping of facilities or patients or anything," she said. "There was a high demand—from clinicians, epidemiologists, the trainers—for maps," but "there was no central GIS; there was no data repository; there was no data anywhere to even start to make a map." Gavette, a GIS coordinator for the National Marine Fisheries Service in California, contacted people who had location information so she could start compiling data for towns, hospitals, and Ebola treatment centers. Although she and her team discovered large amounts of data inaccuracies, they made maps with the caveat that not all the information was correct. The maps still allowed aid workers to visualize large amounts of information quickly. The data inaccuracies inspired Gavette to implement a data collection strategy as well. "What we set in place was that, as the WHO staff visited facilities or went to any of their checkups…they were to begin collecting GPS coordinates from their cell phones so that we could actually start correcting the database and come back with accurate information," she said. At WHO headquarters in Geneva, Pires consolidated all the information that Zolman, Gavette, Lansana, and their teams on the ground were compiling. "What I ended up doing was normalizing and bringing together all this Ebola information…and then consolidating that and making it easily available for really the worldwide response community," said Pires, a lead analyst with National Grid in Massachusetts. He and his team made an Esri Story Map Journal app to present the public with easily digestible Ebola situation reports. 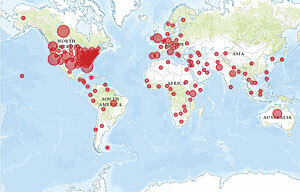 They also set up an ArcGIS Open Data site to enhance public awareness about the outbreak's evolution. All three volunteers regard making and consolidating authoritative datasets a big success. "Hopefully this will leave the countries with better infrastructure data than they had before," said Zolman. "It would definitely help a future outbreak," echoed Gavette. Setting up sound GIS networks for future use is a recurring theme for GISCorps projects. The organization recently completed its seventh mission to Afghanistan, where two GIS professionals went to Kabul Polytechnic University to teach the faculty advanced GIS. John Van Hoesen, a professor of geology in Vermont, and Gary Hunter, a GIS consultant from Australia, continued a multiyear professional development initiative to help the university establish an undergraduate course in GIS—a first for Afghanistan. And remote projects, where volunteers work from home, are becoming ever more useful for establishing good data for current and future use. Brian Baldwin, the lead technical specialist for the utilities team at Esri, completed a GISCorps project after the earthquake in Nepal in which he helped map vulnerable areas throughout the country to let aid agencies know where they should focus their resources. With crowdsourced projects becoming more the norm, now that GISCorps has set up partnerships with organizations such as Humanitarian OpenStreetMap and the Digital Humanitarian Network, the organization's impact is growing exponentially. "We have been launching about 20 to 25 projects per year, starting in 2011," said Elhami. "That's huge." With thousands of extraordinarily dedicated volunteers who are just "thrilled to be able to contribute to the greater good," according to URISA executive director Wendy Nelson, GISCorps will undoubtedly keep demonstrating the benefits of GIS to communities in need around the world. And, given the limitless energy that Elhami, the Core Committee, and other volunteers put into the organization, GISCorps doesn't look like it will slow down anytime soon. Visit the GISCorps website for more information. Read other articles in the "GIS Heroes" series.